“agent of change”. Calling yourself an “agent of change” is currently very fashionable amongst NGOs. But, what does the term actually mean? 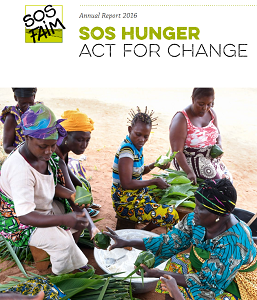 Agents are for action; SOS Hunger wants to take real and eﬀective action. However, not any old action. In its support for civil society organizations in Africa, SOS Hunger attaches particular importance to the dynamics of change. Tat is to say, it supports organizations that struggle on a daily basis for systemic change in the face of growing, unbearable economic, social and environmental inequalities. Our support for a new partner such as Alternative Espaces Citoyens in Niger, or for various farmers’ movements or rural fnance institutions (mostly mutualist) in all the countries in which we operate, underline this objective. On the other hand, working for change also requires action here at home. Change here has a considerable impact on countries of the South. That’s the whole point of our campaign called Changeons de menu ! (Let’s change our menu! ), which invites citizens to change their eating habits by switching to organic and local food. This is also why SOS Hunger has decided to become a member of citizen cooperatives such as Terra, Ouni and the House of Transition (Maison de la Transition – Mesa) in Esch-sur-Alzette. Finally, as the primary causes of hunger and poverty are first and foremost political, in 2016, SOS Hunger continued its advocacy work for greater policy coherence for sustainable development, whether through the NGOs Federation (Cercle des ONG) or the Meng Landwirtschaft platform. Being an agent of change is therefore much more than supporting local development dynamics in the countries of the South. It is a coherent set of activities both at home as well as abroad. It is a strong and united membership that adheres to SOS Hunger’s mission and actions (17 new members have joined the NGO in the last two years). It is based on alliances with stakeholders who share our vision of the world and our values. It is the search for public and private funding, which is ethical and fits with our views. and social justice and for food sovereignty everywhere and for everyone: nothing more, nothing less.